One of many brownish Inocybe species, Inocybe calospora has a scaly cap and grows under hardwoods east of the Great Plains. Its odor is pleasant, rather than one of the typical Inocybe odors (spermatic, like green corn, and so on). The stem does not bruise blue, which helps to separate Inocybe calospora from Inocybe calamistrata--but you will need to use a microscope to identify it with certainty; the spores are very distinct, "with long distinct spines giving the appearance of an ocean mine" (Phillips, 1991/2005). Ecology: Mycorrhizal with hardwoods; growing gregariously (according to Kauffman, "usually . . . in patches of about a dozen," which aptly describes my collection); summer and fall; widely distributed in eastern North America. Cap: 1-3 cm; conical at first, becoming broadly bell-shaped or flat with a pointy central bump; dry; scaly; dark brown to brown. Gills: Attached to the stem (sometimes by a notch) or nearly free from it; close or nearly distant; whitish to pale tan, becoming medium brown or cinnamon brown, with white edges. 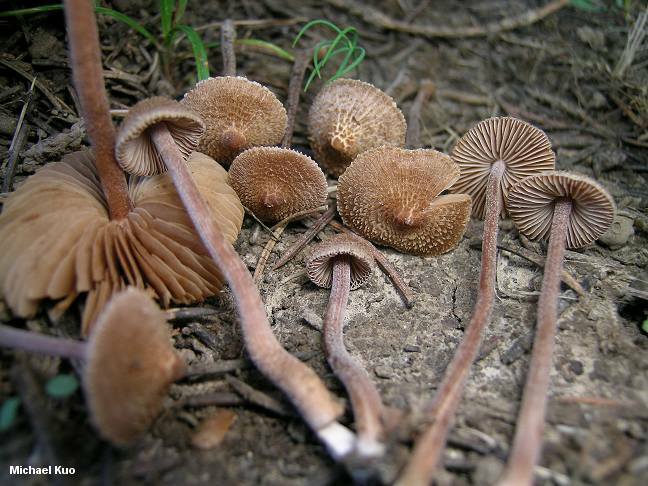 Stem: 2-6 cm long; up to 3 mm thick; more or less equal, with a small basal bulb; dry; very finely hairy; usually pale cinnamon brown to pale reddish brown (sometimes whitish or dark brown); fairly tough; basal mycelium white. Flesh: Yellowish to brownish; insubstantial. Odor: Slightly sweet and fragrant, or not distinctive. Chemical Reactions: KOH on cap surface negative to slightly pinkish. 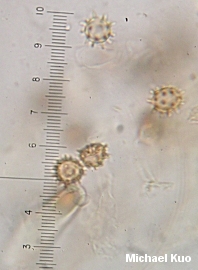 Microscopic Features: Spores 9.5-13.5 x 8.5-11 µ (including ornamentation); round or nearly so; covered with prominent spines 2-3 µ long. Pleurocystidia scattered; up to 55 x 17 µ; fusoid or clavate, often with a flattened apex; thick-walled; sparsely apically encrusted. REFERENCES: Quélet, 1881. (Saccardo, 1887; Kauffman, 1918; Kauffman, 1924; Smith, Smith & Weber, 1979; Phillips, 1991/2005.) Herb. Kuo 10040502.